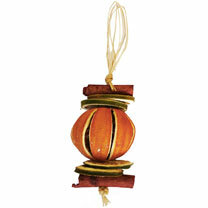 This unique and wonderfully fragrant Christmas tree decoration is made from a whole dried orange, cinnamon sticks and green orange slices, and is scented with ‘Christmas in a Bottle’ oil. Length approximately 15cm. Set of four.